It’s a poetry week this week! 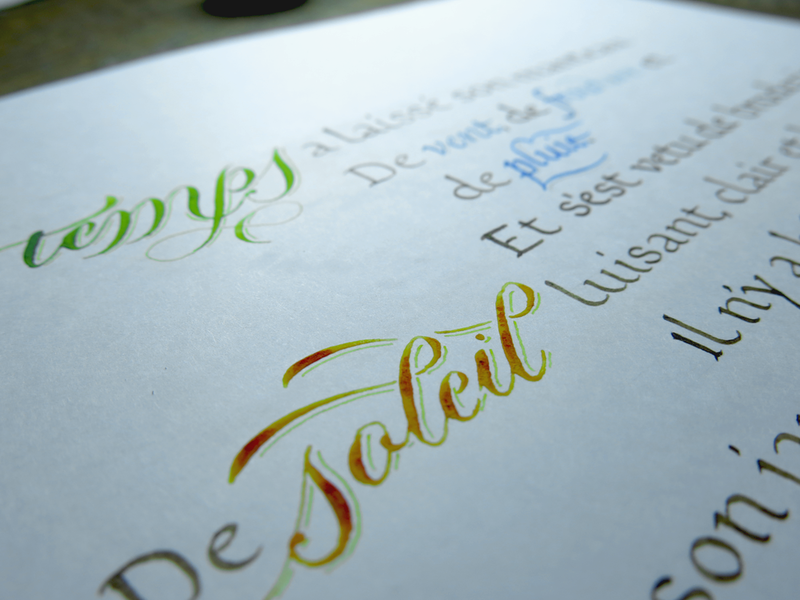 And that means it’s also a calligraphy week. Let’s jump straight in! 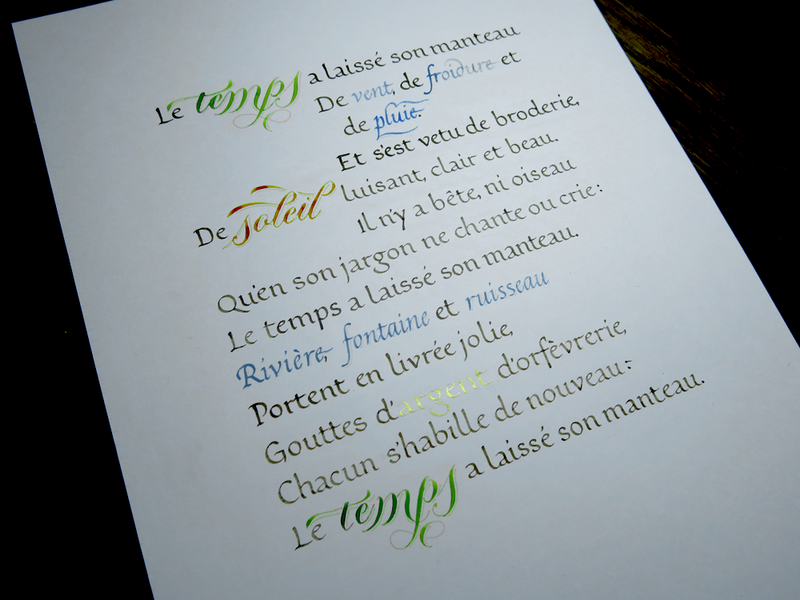 This is a piece in French that I’ve had the idea to write for a long time – a beautiful piece about the change of seasons from winter to spring. In it, there is a lot of beautiful imagery, which is centred around the idea of the seasons taking off their winter coats in the transition to spring. 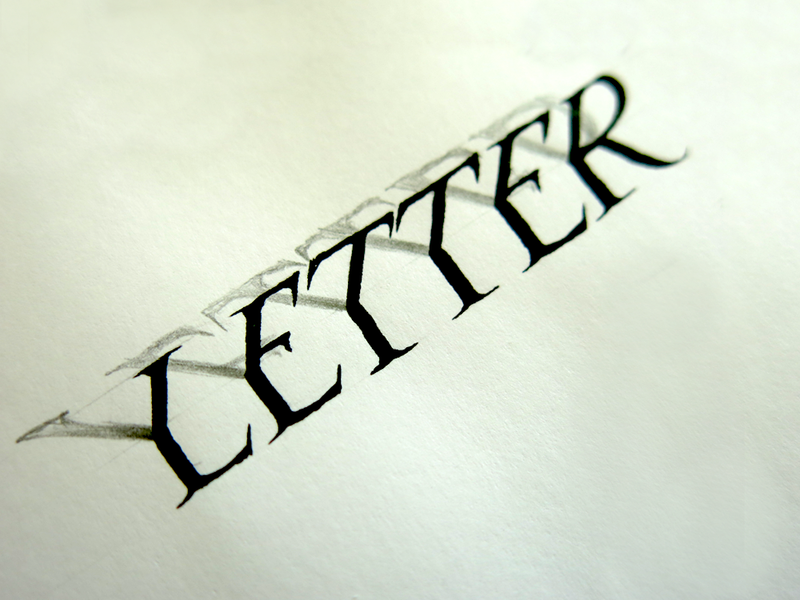 These words afford me, as a calligrapher, fun playgrounds to make the text come alive. Above, you can see the word “argent”, which you may guess means silver, and which is written in gold. 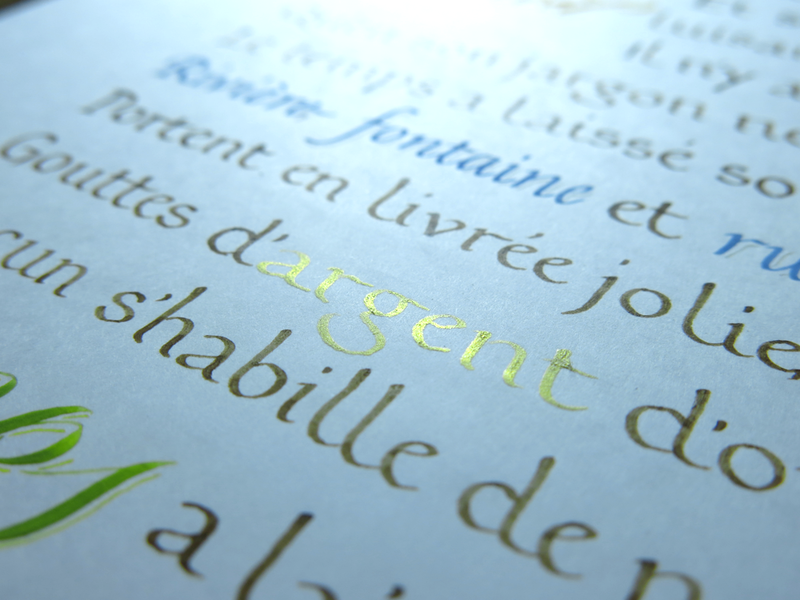 If I had any silver paint, I would perhaps have considered using it, but I don’t and so couldn’t, and ended up using my new gold paint for this word, and though it’s slightly at odds with the meaning of the word, I think the effect is superior to what silver paint would give. In this piece, I used a mixture of styles, both with regards to the expressiveness of the calligraphy and with the choice of hands. Three hands are used here, the main one being Foundational. 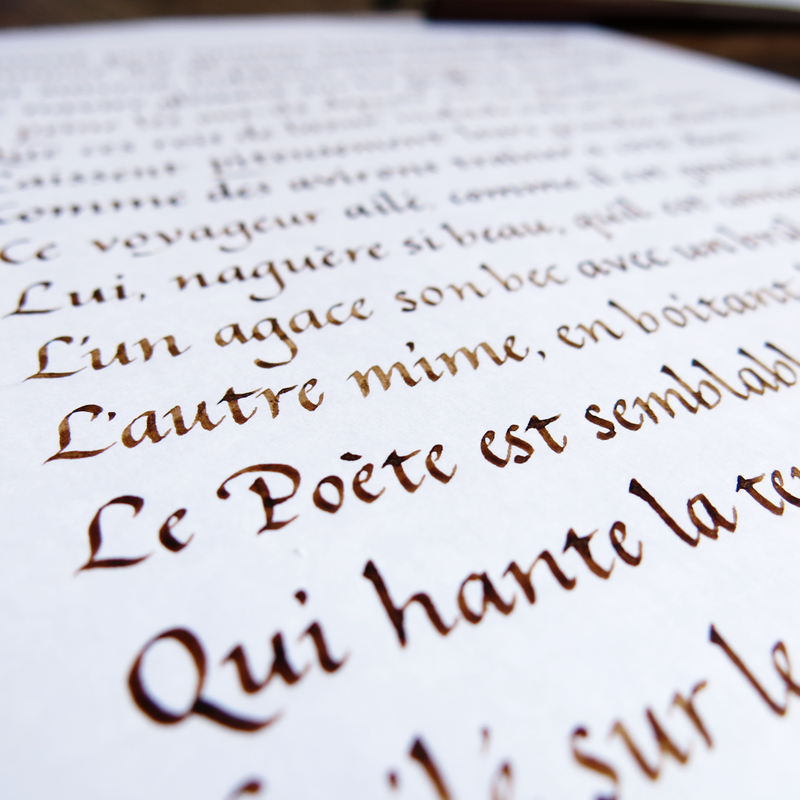 Foundational is a very practical, legible hand, yet it is elegant in an understated kind of way. It’s easy to think of as unimportant, but it really is the backbone of the piece, and does most of the work that you see. 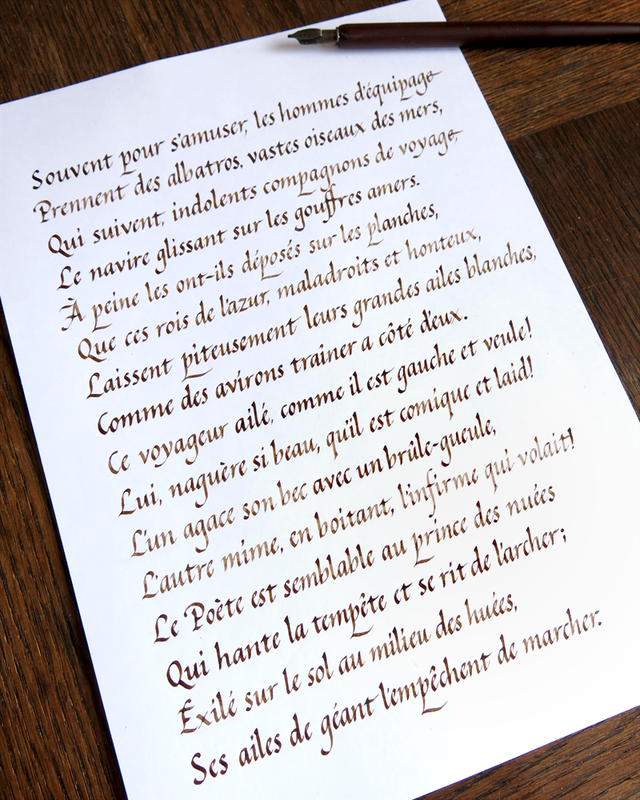 Aside from the Foundational, which is nearly all in walnut ink (except for the “argent” you have already seen), there is also a very expressive and flourished Copperplate. I used Copperplate for these words because it can give so much life to the page, especially when combined with the colours as seen here. with gleaming sunshine, bright and beautiful. The season has shed its coat.